Google Penguin and Panda frequent updates to its algorithm are forcing companies to re-think how to do Search Engine Optimization. Weighting factors around content type, frequency, relevancy and richness are surpassing traditional SEO rank considerations. Further, Social Signals and thus, Social Media Marketing activities are affecting Search Visibility. 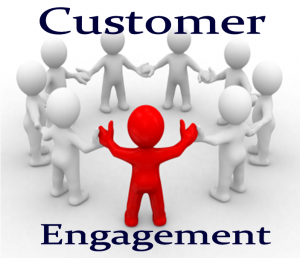 All of this point to the most important success metric on the web: Customer engagement. Your customers need to be engaged on your website and within your social media customer experience for multiple reasons. As the title suggests, Google’s algorithmic changes are now directly correlated to the level of customer engagement on a brand’s important web pages. From a Social Media perspective, customer engagement is truly the only tangible factor to determining social media marketing success, And, when you tie the two together (Social and SEO), you see a direct correlation in brand lift and ultimately, sales. As an Online PR professional, the changes n Google rank make perfect sense to me. My opinion is that Organic Search listings should give priority to those brands, sites and efforts in content that have done an excellent job of staying true to their customer, not simply focusing on how the (search) engine works. So how do you play safely with Google and, at the same time, deliver on and measure your effectiveness in customer engagement? Let’s talk in SEO terms – on-page and off. Giveaway items such as: whitepapers, tips via online video, presentations, mp3’s and recorded webinars. In Social Media as it related to the combined desired results of search visibility and customer engagement, I recommend focusing your Social strategy efforts primarily around Google+, YouTube and Twitter. Let me further explain. Google+ is Google’s social platform. Personalized search results contain links to content of people within their own networks. And so, it makes sense for you to use the platform to deliver your news and content sharing so that it may affect a follower’s search results. Also, because Google + is paired with tools such as Google Hangout and Google Hangout for business, it can enable direct two-way engagement at the platform level. What a better way to engage than to stream content live and talk in real-time to your customers? YouTube, another Google product, provides multiple levels of customer engagement and search visibility around video content. With an appropriate online video strategy, you will be able to deliver professional online video that engages by educating and engaging your target customer. YouTube content is highly shareable and easy to optimize (each piece of video content) for natural search. Speaking of shareable, your video content, if you choose to do so, can be used as embeds on other sites. By allowing others to take your video and post this content on their site, you may be enabling strong backlinks. Generally, companies that take your content are ones that support your topic-related content and that is great for off-page SEO work. You should always monitor where your YouTube content lives online, so that if your videos end up anywhere you do not want them to, you can take action. Some key points to remember with YouTube are to have a YouTube marketing strategy that focuses around popularity of video and large # of real subscribers. Google weighs this heavily as well. A YouTube embedded link of a video on your media section of your website is a smart way to go as well to engage users with video content that is surrounded by other compelling content, such as an article, images or audio. In this way, you have the opportunity to engage more users. Twitter is truly a social media search engine. In fact, Google has confirmed utilization of Twitter’s search results in its own algorithm, again support a newer model that rewards credible authors and content. Utilizing Twitter effectively, by using it to build your brand, support your colleagues and customers, can aid in your Twitter page relevance in search listings. Further, Twitter’s ability to share stories quickly and respond immediately to customer requests or questions, makes it a real-time customer engagement tool. Overall, Google’s support of real ways to drive customer engagement now lifts the SEO veil off of duplicate sites, affiliate sites, poorly written web copy, spammy links, poorly produced content and keyword stuffing. Further, it forces brands and companies who use the web as their main marketing and branding vehicle to think target strategy first, search visibility second. I applaud Google for putting branding procedures back into place in the way we build and grow our online communities.